This work explores the nonlinear coupling between wall deformation and one-dimensional electrokinetic transport in a nanochannel with negatively charged walls. Within the framework of nonequilibrium thermodynamics, compact formulae are derived for the electrokinetic transport parameters in terms of Onsager phenomenological coefficients and, subsequently, for the energy conversion efficiency. Results confirm that Onsager’s reciprocity principle holds for rigid channels. However, the methodology used to reduce to 1D does not maintain the symmetry of Onsager’s matrix when the channel is deformed due to the introduction of a “fictitious” diffusion term of counter-ions. 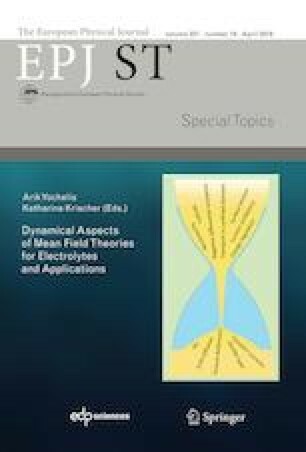 Furthermore, the model predicts a reduced efficiency of electrokinetic energy harvesting for channels with soft deformable walls.